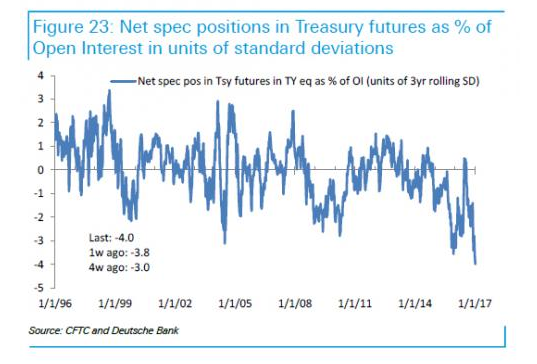 Zerohedge has an interesting post out today called Treasury Specs Are So Short, It Is Now A 4 Sigma Event. Let’s take a look at his charts and a couple of mine. 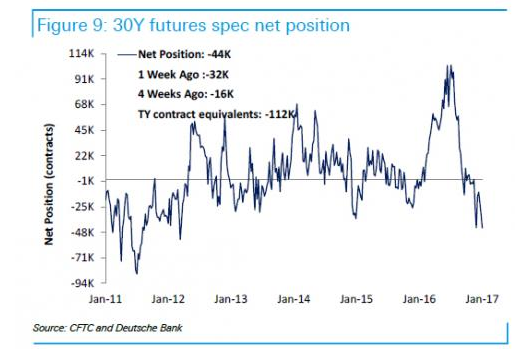 According to the latest breakdown of short positions by Deutsche Bank, speculators increased their net shorts by $7.7 billion in 10Y cash equivalents to $99.4 billion, a third successive week of record low positions. 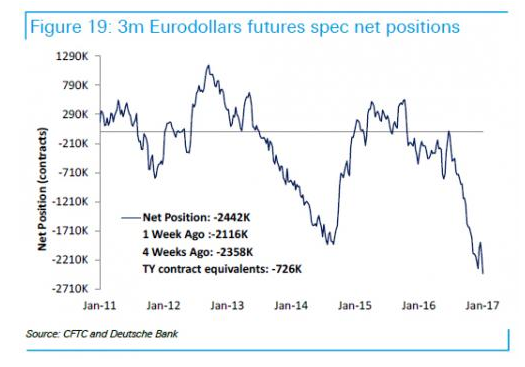 The above charts and comments from ZeroHedge via Deutsche Bank. For every future short there is a future long, so the net is always zero. In this case, the commercial traders are long and the speculators are short. Eurodollars have nothing to do with euros. They are actually an interest rate play on US dollars. Short eurodollars is a bet that interest rates in US dollars will rise. Belief in the Trump economy is extremely high. 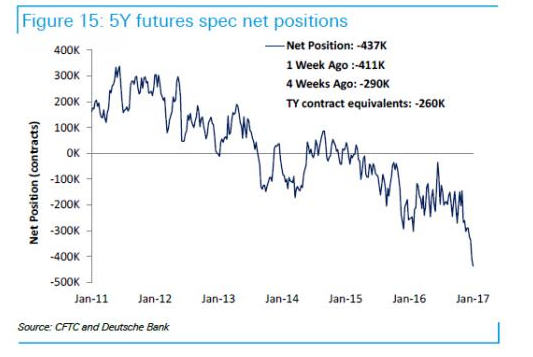 Treasury Shorts keep piling on even as yields decline. Those short from 3-4 weeks ago are already underwater. A very explosive short-covering setup is in play. All it takes is one very bad economic report and yields will plunge. Related post: Trump Euphoria Sets In; Small Businesses Optimism Surges Most Since 1980: What’s It Mean? My model was showing 2.4 as fair value, now showing just over 2.5. We’re at tbe point where we may find out who the real Bond King is. I think it will take more than one economic event. As long as Trump appears to be succeeding, the situation will persist. The markets are giving him the benefit of the doubt and the time to make it happen as long as he appears to keeps winning. 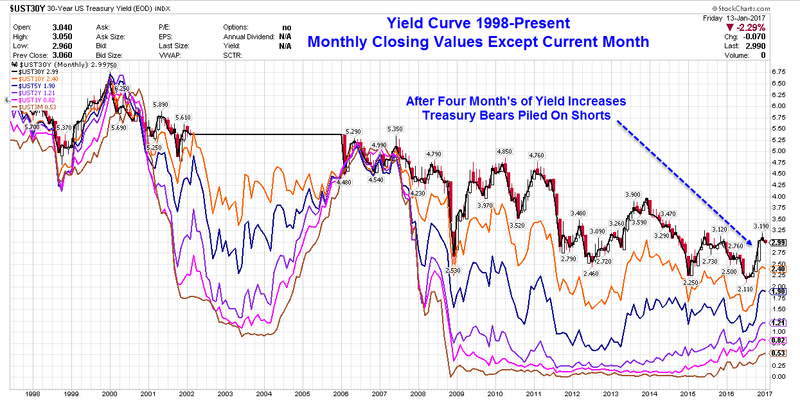 I agree and believe that we have yet to see the cyclical low in 10/30-year Treasury yields. This “recovery” is already the 2nd or 3rd longest on record, and those cyclical lows will likely come (compliments of the Fed, via a return to ZIRP and QE) when the inevitable recession hits, sometime in the next 12-18 months. 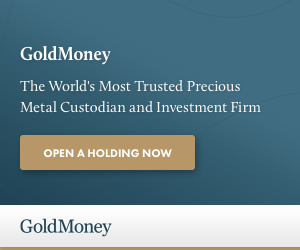 Can we really believe what the CFTC and DB say. My goodness we all know the whole financial system is rigged. I don’t know that. I just think most people are financially illiterate. The interesting thing is that yields have been falling since mid dec even as shorts doubled down, which would normally push rates up. 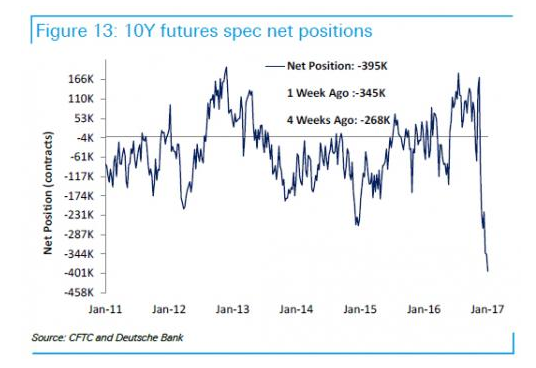 we might be at the point where shorts stop increasing their position, is so the fall in yields will accelerate, shorts would then panic. 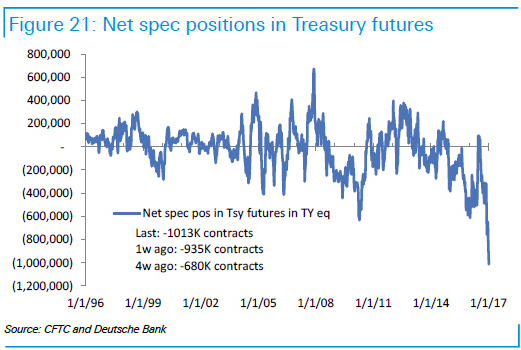 Shorting Treasuries is shaping up to become a “Widowmaker trade” – a la shorting JGB’s from 1991-present. You can’t fight the Central Bank (s). Comments like this generally mark ridiculous confidence more associated with peaks than anything else. In this case, peak confidence in the central banks.